Everyone watches this - take detailed notes on each field. You will need this for your interview and for LIFE. Put screenshots of your completed work into a google doc to submit at end. How to solve ANY circuit - VIDEO - Excellent! Principles of Engineering (POE) is a foundation course of the high school engineering pathway. This survey course exposes students to some of the major concepts that they will encounter in a postsecondary engineering course of study. 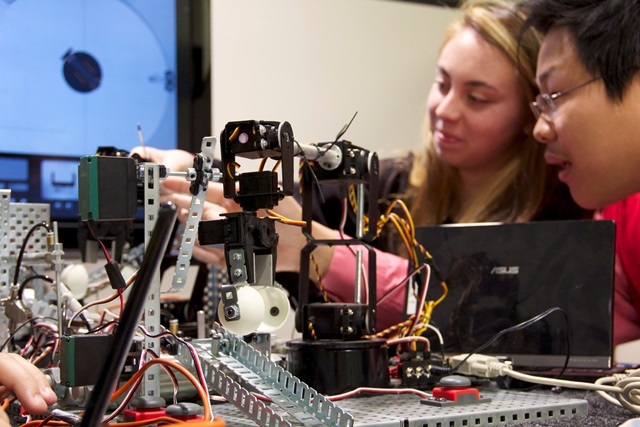 Through problems that engage and challenge, students explore a broad range of engineering topics, including mechanisms, the strength of materials and structures, automation, and kinematics. The course applies and concurrently develops secondary level knowledge and skills in mathematics, science, and technology. Students have the opportunity to develop skills and understanding of course concepts through activity-, project-, and problem-based (APB) learning. By solving rigorous and relevant design problems using engineering and science concepts within a collaborative learning environment, APB learning challenges students to continually hone their interpersonal skills, creative abilities, and problem solving skills. Students will also learn how to document their work and communicate their solutions to their peers and members of the professional community. It also allows students to develop strategies to enable and direct their own learning, which is the ultimate goal of education. The goal of Unit 1 is to introduce students to mechanisms, energy sources, and alternative energy applications. Students will gain an understanding of mechanisms through the application of theory-based calculations accompanied by lab experimentation. They will also learn that as energy and power are transferred and transformed, losses to friction in the system will occur. Students will understand that such losses affect the overall efficiency of the system. They will have an opportunity to investigate thermal energy and alternative energy applications. Students will explore and gain experiences relating to solar hydrogen systems and thermal energy transfer through materials. The unit concludes with students working in teams to solve a design problem that focuses on energy and power. They will use the knowledge and understanding built through the previous learning events to create a solution to the problem. It is important for students to understand that an acceptable solution is one that fits the criteria and constraints of the design brief. The goal of Unit 2 is for students to have a more concrete understanding of engineering through materials properties and statics. Students begin by learning about beam deflection and then forces on truss structures. They learn to identify forces acting on those structures and then gain the ability to calculate internal and external forces acting on those structures. The students learn about material properties, which lead students to the ability to properly select a material for a given task. Creating new products to meet a given need or want is not the only concern in this area of study. How to reuse/recycle materials for continued and unique uses is also learned. The primary way of studying materials properties in this unit is through destructive and non-destructive material testing on various materials. Tensile testing is the major destructive test. Students are engaged in how machines perform these tests and use either a classroom machine or a simulation to further their understanding of these processes. This unit concludes with a design problem whereby students, working in teams, follow the design process to solve a design problem. The goal of Unit 3 is for students to recognize the abundance of and infinite variety of computer use in our daily lives. Students learn to control mechanical systems by recognizing computer outputs and gaining an understanding of how to write code to control them. They additionally experiment with various input devices and learn how they can adapt computer code to control computer outputs. Furthermore students gain an understanding of fluid power, both hydraulic and pneumatic. They begin to recognize the power and control advantages of fluid power. The unit concludes with students working in teams to solve a design problem that focuses on using control systems. They will integrate their prior knowledge, skills, and understandings from Unit 1: Simple Machines, Unit 2: Material Properties, and this unit. Students will decide what input devices to use, how to code their use, and the various output devices necessary to create a solution to the problem. In Unit 4 students are engaged in learning to use statistics to evaluate an experiment. Later they begin a study of dynamics, specifically kinematics, and apply statistical skills to study freefall motion. Students use theoretical and experimental data as a basis for learning statistical analysis. By collecting, organizing, and interpreting the data, students build the skills needed to understand data results. They further use these new skills and knowledge to design a vehicle that will propel itself. Later, students will address the problem of designing a machine to accurately launch an object a specified distance. Examining projectile motion is at the core of this design problem.